This book concentrates on the Rowland male line since about 1580. I have tried not to be side tracked by too many diversions, otherwise it would become a never ending story. But all rules must be broken. I am going to digress into the Mawle and Cowdery family trees, largely because I have them, but also because some of my forbears there, particularly my grandmother, Elsie Mary Cowdery (née Mawle) were larger than life. The Mawle family tree (Trees 15 to 23) goes back to 1720; they were merchants and farmers, and by the end of the 19th century owned and ran the main agricultural and ironmongery suppliers in Banbury. John Mawle (1832 – 1917) set up the business with a dowry of £800 (now £48,000) which he demanded from his future father in law. If this was not forthcoming with a further instalment of £300 to buy a house, John Mawle said he should tell his daughter Betsey that she should treat the past as though it had never been! Betsey’s father paid up enabling John Mawle to make a small fortune and become mayor of Banbury. He entertained General Booth, the founder of the Salvation Army at his home, considered the only house, grand enough in Banbury to accommodate the good General; who would eat neither flesh, fish nor fowl, just a little rice pudding and apple. John Mawle’s son, John Taylor Mawle (1860-1948) was my great grandfather and was also one of the great and good and Mayor of Banbury. He had 6 children and 3 wives. I have the wedding photo taken in 1915 of the marriage of his daughter, Elsie Mary (my grandmother) to Arthur Reginald Cowdery. They all seem to be taking it rather seriously, bedecked in hats. Elsie’s sister Queenie and brother Billie were there. He had the look of Oscar Wilde, and later became a successful entrepreneur running his British Empire typewriter company in Birmingham. He was in the Royal Flying Corps, and returned with his brothers from the First World War to find to their disappointment that their father had sold the family business to allow him a comfortable 40 year retirement, leaving them to fend for themselves. Uncle Harry was John Taylor Mawle’s first cousin and was a farmer at Weston by Weedon. Here I was introduced to farm life, travelling around the fields in the horse drawn “float”. There was also a collection of ancient tractors in the yard; I always closed by eyes when walking in front of them. My aunt Margaret used to help on the farm during her school holidays. Uncle Harry always called her “ MAARgrit”. My grandmother, Elsie Mary (called Nana by me) was the second daughter. She always said that her older sister was called Queenie because she was so beautiful. By comparison Elsie Mary was plain with crooked teeth; she had them all out in her late teens when she could afford the dental bills-no National Health then! Her family were strict Baptists and she was baptised by total immersion, and she had a traditional Victorian domineering father, rather different from the more hedonist Alexander William Rowland. Not surprisingly she ran away from home at about 19 to London where she learnt to make hats (I wonder if she worked in the Millinery Works in Islington where I exhibit my etchings) She met Arthur Reginald Cowdery, then a bank clerk. At that stage they were too poor to marry, but when Arthur started as a subaltern in the First World War infantry his pay improved and marriage became possible. I was not told much about the Cowdery family (Trees 24 to 29) Possibly they were Huguenots who settled in London after the revocation of the Edict of Nantes in 1692. If so they could have been weavers in Spitalfields at the same time as Robert Rowland was an armourer on the other side of the City. The name Cowdery could come from Cuir du roi (Corduroy) but my cousin, Nick Cowdery says it means a hazel thicket. Perhaps he will take up the challenge of unearthing their family history. Possibly they had an interesting ancestor in Oliver Cowdery, a colleague of Joseph Smith, the founder of the Mormon Church. Smith dictated most of the Book of Mormon to Cowdery in 1829, based on Smith’s revelations, when in Harmony, Pennsylvania. Apparently Smith and Cowdery were ordained by John the Baptist, and then baptised each other in the Susquehanna River. They also received a visitation from three Apostles, Peter, James and John, who ordered them to restore Christ’s church. Later, when Smith turned to polygamy, marrying his servant, which Cowdery called a “dirty, nasty, filthy affair”, Cowdery and other early Mormon leaders were expelled from the church. Arthur Reginald’s father was called George Edmund and had an identical twin brother called Jim. They both worked as cashiers at the In and Out Club in Piccadillythey wore identical uniforms and I don’t know if the club was aware that there were two of them doing the same job. They were clearly close; in the 1891 census, they are recorded as living cheek by jowl with their respective families at 20 and 22 Eustace Road, Fulham, George sharing with his parents in law James and Anne Boyle. James had a business retailing leather goods, from his shop off Knightsbridge. Wedding photo of Arthur Reginald Cowdery and Elsie Mary Mawle, Banbury 1915. 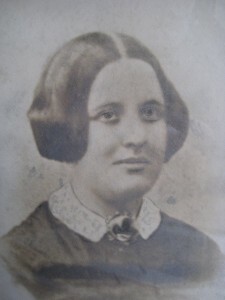 Jim Cowdery’s daughter Edith married into the Batty family. Their son, Ronald Batty, who was my mother’s second cousin, married Christina Foyle, who was the daughter of Willie Foyle, the founder of Foyle’s bookshop. He and his brother Gilbert started the business, after failing their Civil Service examinations, by selling their textbooks from a barrow. Willie married Christine Tulloch, the daughter of Daniel Tulloch from Sullom, Shetland and they and later their daughter, Christina lived at Beeleigh Abbey, Essex and had a magnificent library there. I can remember old Willie showing us the books, wearing holy white gloves; of course we could not touch them; it could affect their value. He certainly knew about that; the collection fetched £12.5 million after Christina’s death in 1999. She left a legacy of £100,000 for the benefit of her tortoises.It’s reassuring to have eccentric relations. By the 1901 census, George Edmund had moved to 69 Haldon Road, Wandsworth with his wife Elizabeth née Boyle and two sons Arthur Reginald and Henry, whose side of the family emigrated to Canada and married into the Diment family. Also my aunt Margaret emigrated there, marrying Tony Pollard and having four children. My uncle Terry’s son Nick and his family carry on the Cowdery name in London. His brother Desmonde lives in Houston. 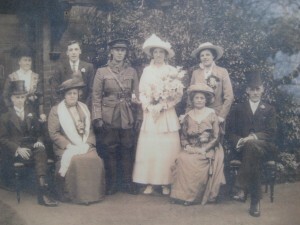 My grandparents were married in 1915, with Arthur in uniform, before returning to the trenches. Their family home was in Gressinghall Road, just round the corner from Haldon Road. My mother, Joyce Mary was born on 26th June 1916. Her father did not see her until she was over a year old. Amazingly he survived the Somme offensives, once by his silver cigarette case, in his breast pocket, which deflected a bullet. Another time, it was his tin hat deflecting shrapnel. But a small piece lodged in his forehead, missing his brain by a hair’s breadth, and creating a permanent “bump” visible in my mother’s portrait of him. He recovered and became a branch manager at Barclays Bank, moving from branch to branch; he was at Swindon in 1929, then moved to Oxford in 1934, and finally to Ascot in 1939. 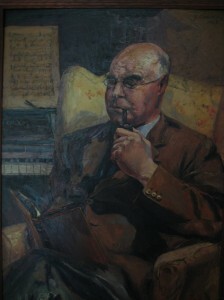 His portrait by my mother shows him balding with rimless glasses, looking rather like a Captain Mainwaring character. My grandmother always said that he was the wisest and kindest of people, and that I took after him! As is the case with my paternal grandfather Willie, I never knew him; he died shortly before my parents married in 1943. This must have been a time of great consternation for my grandmother. Her son Terry (called Ging by me) was in the King’s African Rifles in Kenya and her other daughter Margaret (called Aga by me) was at school aged 14. A bank manager’s widow’s pension would have been very small, so she returned to her millinery skills, becoming manager of the ladies hat department at Whiteley’s. With her capital, she bought the fag-end of a large leasehold in Elgin Avenue, which she ran as a block of bed-sitters. I used to go with her each week from Lexham Gardens where she had a flat at no 9 (my parents’ flat was at No 84 and despite or perhaps because of this proximity my father always called her “Mrs Cowdery”). There she collected the rent and dealt with tenants’ disputes, evicting with great aplomb undesirables, such as prostitutes and abortionists, this was of course before the Rent Acts gave protection to furnished tenants. She then moved on buying a large freehold in Richmond partly occupied by difficult protected tenants. It was a gamble but she saw them off. Readers of my book The Isle of Vaila, Vol 1, a Miscellany, will know of my predilection for strong women. Possibly the genesis of this was witnessing my grandmother dealing with those difficult tenants. Once she called in the police and they sent a very callow youth who took off his helmet. She immediately told him to put it back on and stand behind her. “ I’ve got the law behind me.” she said as she evicted the tenant! My aunt Margaret trained as a physiotherapist and later emigrated to Canada (probably also escaping from her domineering mother) She is softly spoken, and a caring wife and mother of her four children, my first cousins. But one story shows that inner grit. After the war bus services were still sporadic and one day she was waiting at Sunninghill bus stop in the pouring rain in the winter of 1947/8. An elderly man driving a van stopped and offered her a lift. When in the Land Army in Cornwall she had often accepted lifts, and was pleased to get out of the rain. But the driver clearly had another agenda; he parked his van next to a wall so she could not get out, and made to assault her. In an instant she grabbed a mallet from a toolbox behind the seat and battered him into unconsciousness. She then made her escape clambering over his limp body. The next day she and her mother scoured the papers for any reports of unconscious or deceased van drivers in the Sunninghill area, but none were reported! Mervyn Tulloch from Canada has sent me family trees of the extensive Tulloch family (over 1000 members) from Northmavine, Shetland which complement my researches relating to the Foyles and the Tullochs. Thanks to Mervyn’s researches we now have links for Christina Foyle (whose husband Ronald Batty was my mothers second cousin) going back six generations to Laurence Tulloch born about 1749. See Tree 24A. This shows four generations from Laurence Tulloch (b 1749) to Captain Thomas Tulloch who married Marion Jamieson. Thanks to an article from the Shetland Times in August 1932 unearthed by Frank Nicolson, describing a visit to Shetland by William Foyle and his wife Christina to discover their Shetland roots, more information is available about the death of Captain Tulloch’s wife in Lerwick, and the adoption of their son Daniel by the Moats of North Moors. He trained in Lerwick as a watchmaker and jeweller, and moved to Gateshead in 1878 and married Helen Marion Gifford. They had four daughters, but both Daniel and Marion died by the time the eldest was 14. A sister of Sir Rider Haggard, the author, was a friend of the family, and arranged for the orphaned children to be taken by a Christian hostel, the Kilburn Sisters’ Home in North London. There Christina worked in the bookshop associated with the Home, and so met William Foyle her future husband, who was starting his career as a celebrated bookseller. Wow! Auntie Margaret. The Sunday roast is very tame in comparison! Oh, and please a copy of the photo of your parents’ wedding, Richard. I assume that is my grandfather Bille not wearing a hat? Btw, on my father’s side we are connected to the Tulloch’s from Perth who were directly descended from George Swan, illegitimate son of Charles II. Thanks Vanessa-yes thats Uncle Billie looking like Oscar Wilde.I will send you a copy. Hamish mentioned the Goldie Scot lineage going back to the 6th century (AD that is)-has this been assembled/published-could we do a link to it? You will see we have a tenuous link to the Tullochs of Shetland. Vanessa, when your grandfather, my Uncle Billie returned, from the First World War he and his brothers faced not only the disappointment of the sold family business that Richard mentions. There were few families where all the sons returned from the war. Many families lost at least one son and, very often, all their sons. Uncle Billie told me that when the war ended, and he and his brothers all returned alive, the other people in their village looked upon his family as having had “unfair” good fortune. He said they were despised. Consider that Uncle Billie mentioned this to me some 50 years later. The impact of this ill-will on him must have been profound. Regarding the Foyles and Tullochs I have recently received from a member of the Shetland Family History Society, an extract from the Shetland Times of August 1932. 1-When Marion Tulloch went to Liverpool to meet her husband in 1853 both she and her baby were killed in an accident. She was not accompanied by her son Daniel who was then about 3 years old. He was adopted by the Moats of North Moors and received an excellent education, becoming a watch maker in Lerwick. 2-In 1878 Daniel Tulloch went to Gateshead and married Helen Gifford, daughter of John Gifford of Lerwick. Daniel and Helen had four daughters, Helen, Christina, Catharine and Dorothy. 3-Daniel became a journalist “having a particular talent for that work” but not being of robust constitution died when his eldest daughter was 12. Two years later his wife Helen died and the orphaned children were accepted by the Kilburn Sisters House in London. This was organised by the sister of Sir Rider Haggard, the author, who had taken a keen interest in the children. 4- Christina subsequently worked in a small bookshop connected with the Kilburn Sisters House. While there she met Willie Foyle and subsequently married him. 5-Her elder sister Helen continued to work in the Sisters bookshop; her other sisters married and lived in the south of England. 6-On her visit to Shetland in 1932, Christina Foyle made contact with the Giffords, her mother’s family but she was not successful in tracing relatives of her father Daniel Tulloch. She did however locate a “timepiece” made by him which was sent to her London home.